The new Valmet tissue machine will add 30,000 tons per year of tissue paper to Papel San Francisco's current production capacity. 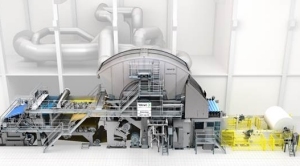 March 28, 2019 - Valmet will supply an Advantage DCT 100TS tissue production machine to Papel San Francisco in Mexico. The new machine will be installed at the company's mill in Mexicali. The new tissue machine will have a width of 2.8 meters and a design speed of 2,200 meters/min., and will add 30,000 tons per year of tissue paper to Papel San Francisco's current production of toilet tissue, kitchen towels and napkins. Currently, Papel San Francisco has the capacity to produce 180,000 tons of tissue products per year. Valmet's scope of delivery includes an Advantage DCT 100TS tissue machine equipped with an OptiFlo headbox and cast alloy Yankee cylinder. Start-up is planned for the third quarter of 2020.